The extension is named after Michael Chetcuti, one of the Malta Medicines Authority assessors who died six months ago. 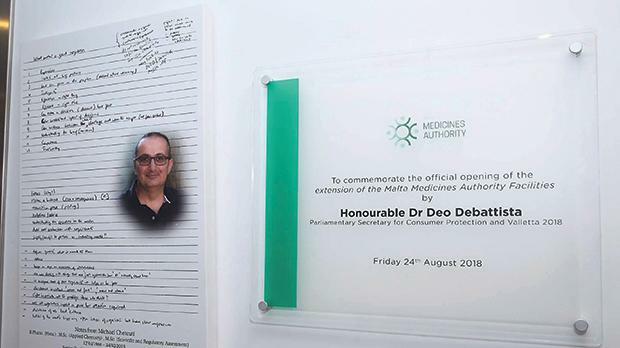 The Malta Medicines Authority has inaugurated an extension to its premises in San Ġwann, which is named after Michael Chetcuti, one of its assessors who died six months ago. The extension was inaugurated by Parliamentary Secretary for Consumer Protection Deo Debattista who said more space was needed as the authority was employing more people to keep up with the workload. The success of the Malta Medicines Authority is attributed to the motivated professional employees who operate in a proactive environment to meet the dynamics of scientific development, stakeholder needs and local and European regulatory requirements. The authority has experienced sustainable growth with the help of highly-qualified employees, Dr Debattista said. Dr Debattista said discussions were ongoing with local and international stakeholders to ensure the quality and safety of medicinal cannabis products from seed to patient. Forthcoming projects in-clude the scientific regulation of medical devices and veterinary medicines. He said the Malta Medicines Authority was recognised by the European regulatory network and the US Food and Drug Administration for its high professional and scientific standards. Mr Chetcuti passed away in February. He was known to colleagues and people in the industry as an exemplary medicine assessor.